A search for traces of the Great Emancipator in today’s America. Weekly Standard senior editor Ferguson, an Illinois native, became a Lincoln buff at an early age. So protests against a proposed Lincoln statue in Richmond, Va., aroused his curiosity: Why do so many hate this revered president? He attended meetings of the protestors, as well as the dedication of the statue, and began to learn just how much baggage Lincoln still carries. The Richmond statue was paid for by a commercial collectibles company that planned to recoup its costs by selling miniature replicas of it. The anti-statue forces blamed Lincoln for everything wrong with modern America, big government and big business in particular. Inspired by the memory of what Lincoln used to mean to him, Ferguson decided to explore other Lincoln sites. He found his boyhood image of the Great Emancipator undercut by recent historians’ new vision: Lincoln as a flawed, ambiguous figure posthumously co-opted to embody establishment values. The author was also disillusioned to find that the National Park Service does what it can to keep anyone from getting too close to the artifacts in the Lincoln historical sites under its auspices. And he was almost equally nonplussed by the Lincoln buffs who amass their own collections of artifacts, from signed documents to bits of cloth purportedly bearing bloodstains from the assassination. Ferguson handled an original copy of the Gettysburg Address at the Lincoln Library in Springfield, Ill. 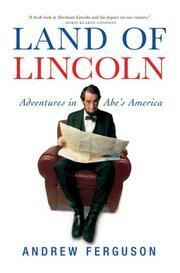 Finally, he took his family along the Lincoln Trail, visiting sites in three states. His narrative mostly records the depredations of the Park Service and the new historians, but the author manages, in the end, to recapture his faith in the Lincoln who means the most to him: the icon who inspires people around the world with a vision of freedom. Colorful, opinionated, openly hostile to the new historians—and great fun to read.